I say this drink is "kickin'" because it's incredibly spicy. It won't burn your mouth, bit it will awaken your senses. The star ingredient is the ginger-peppercorn syrup, which gives the drink a potent yet refreshing kick. 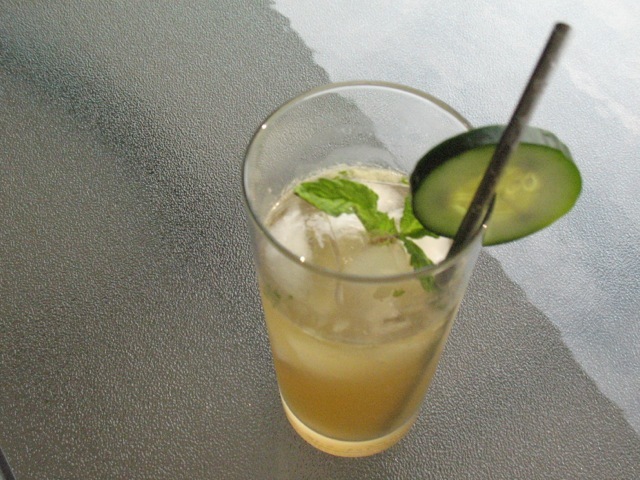 To temper the heat, I added other soothing ingredients: fresh mint and muddled cucumber, plus the herbal taste of yellow Chartreuse liqueur. The syrup is also good with just gin, lime juice and club soda, if you want something simpler. Add syrup and mint to shaker and muddle. Add cucumber and muddle again. Add ice, lemon juice, Chartreuse and gin. Shake well and strain into collins glass with ice. 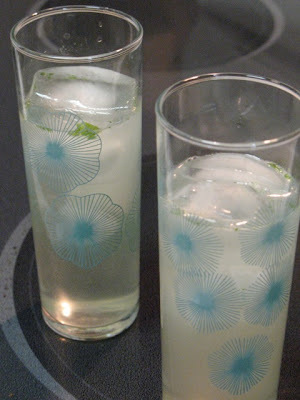 Top with club soda and garnish with cucumber slice and mint. *To make ginger-peppercorn syrup, combine 2 tablespoons coarsely cracked peppercorns, ¼ cup chopped ginger (about 3 inches peeled ginger root), 1 cup water and 1 cup sugar in a medium saucepan. Bring to boil and cook 2 minutes. Reduce heat to low and simmer 5 minutes. Remove from heat and steep for 40 minutes. Strain out solids. Today's feature story is about chefs becoming well-known for cooking ethnic food that isn't a match for their own ethnic heritage. Portland, Oregon's Andy Ricker of Pok Pok and the new Pok Pok NY is prominently featured, as is Alex Stupak of Empellón Cocina (and Top Chef first season winner Harold Dieterle, whose cooking I'm a big fan of). Writer Francis Lam discusses how sometimes such chefs are able to better adapt foreign cuisines to American palates because they aren't as tied to the culinary traditions they are inspired by. Sort of a light week from my point of view. The only other story I was really into was Pete Wells' review of Back Forty West, the new Soho eatery that's moved into the former Savoy space. I wasn't really wowed by today's recipes; even Mark Bittman's Charred Peppers didn't excite me much. The Washington Post led with David Hagedorn's feature on modernist cuisine with a focus on the equipment chefs are using to marry homestyle cooking with techniques from molecular gastronomy. There's a nice photo gallery with the online version. Mintwood Place, Elisir and Rogue 24 are among the restaurants featured in the story. Jane Touzalin has a preview of 10 must-have cookbooks perfect for summer. Aliza Green's Marking Artisan Pasta sounds particularly intriguing to me, as does the recipe adapted from Annie Rigg's The Meat Free Monday Cookbook for Sicilian Cauliflower Pasta. Greg Kitsock has a story about beer breweries doing more to lure guests for tours and tastings, although I'm a little confused about his statement that in D.C. breweries can offer tastings but the beer cannot be consumed at the brewery, since DC Brau's website says exactly the opposite: that it MUST be consumed inside the brewery. Dave McIntyre reviews chardonnays made from Oregon-grown grapes, including the Chehalem Winery Inox Chardonnay, a crisp and fruity unoaked style that I sampled last winter and thought was quite good. Tom Sietsema's First Bite is a rather unusual choice: the buffet at the National Gallery of Art, although it makes more sense once you read that José Andrés did the Catalan-influenced menu, designed to tie in the current Joan Miró exhibit. Lastly, Tim Carman profiles food truck ChefDriven, the project of former brick-and-mortar chef Jerry Trice from Annapolis. The Washington Post. A nicely balanced week of features, equipment, cookbooks, recipes and drinks. With Memorial Day ushering in the (unofficial) start of summer, I'm even more in the mood for fresh, local ingredients as the region's farmers markets swell with produce. We stopped at a market on our way home from the beach today and picked up some berries. It was Chris's suggestion that I make a fruit salad, which turned out to be just perfect today. For the dressing, I used a simple combination of lemon juice, lemon zest and honey, augmented with fresh basil. To make basil ribbons, known as chiffonade, stack the basil leaves largest on the bottom, roll up the stack and make thin slices across the roll (see photo at right). 1. 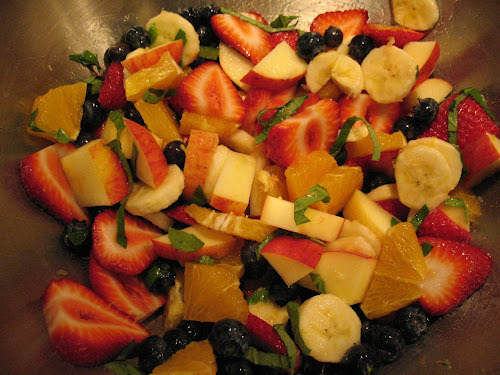 Combine fruit in a large bowl. Add basil and lemon zest. 2. Whisk together lemon juice and honey. Pour over fruit and stir carefully to combine. Want to really impress a crowd and make them think you slaved in a hot kitchen for hours (without really doing that of course)? Time for homemade pasta. Making pasta is surprising easy. Every time I do it, I wonder why I don't do it more often. Clearly, it's not as simple as tossing a box of the premade stuff into a pot of boiling water, but it's not so complicated as to require days or even hours of your time. In fact, I made this dish from scratch start-to-finish in exactly 1 hour. The secret to making quick homemade pasta is to rough it a little. 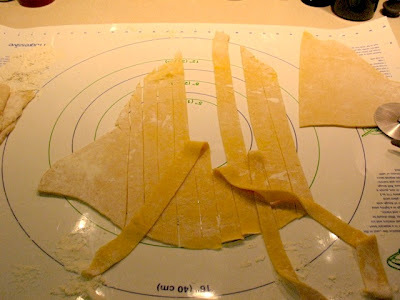 I have a pasta rolling kit for my Kitchen Aid mixer, which I like and use from time to time, but doing so increases prep time significantly, makes a bigger mess and is more fussy than if you use a much simpler tool: a rolling pin. Sure, you won't have perfectly uniform results, but there's something kind of nice about that. The uneven thickness and odd shapes says "homemade" in a way that perfectly cut thin linguine does not. I've tried homemade pasta recipes from Mark Bittman and Mario Batali. The approach for this recipe combines what I've learned from the both of them. For the flour, I used half all-purpose flour and half pasta flour (i.e. semolina flour). Semolina flour is coarser than all-purpose flour, so the resulting dough must be kneaded a little bit (unlike Bittman's all all-purpose flour dough which doesn't need kneading--say that parenthetical a few times fast). 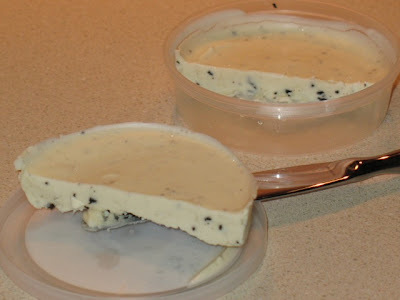 It also requires a little more moisture to come together well. I ended up adding at least a tablespoon of water after mixing the dough to make it form a nice ball. This is a compromise: getting the easier handling of regular flour with the superior flavor of semolina. After letting the dough rest for about 30 minutes, I rolled it out. The thinner the better--no more than 1/8-inch thick and even that is pushing it. After that, I use a pizza wheel to cut it in strips about 1/2- to 3/4-inch wide. 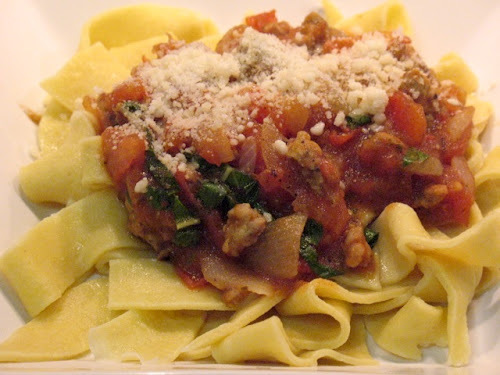 This mades it pappardelle, a type of wide fettucine. It cooks really quickly, just a couple minutes in boiling water. For the sauce, I went with something pretty traditional here: a tomato sauce with onions, sausage and basil. I used the Whole Foods chicken sausage and mixed hot and mild. 1. Add flours and salt in a food processor and pulse a few times to combine. Add eggs and keep machine running until dough comes together in a ball, adding water as needed to help it come together. 2. 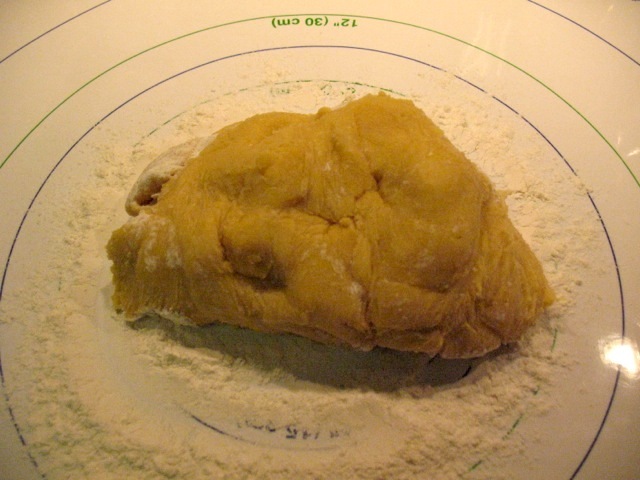 Place dough on a lightly floured surface and knead until dough is smooth and a bit elastic. 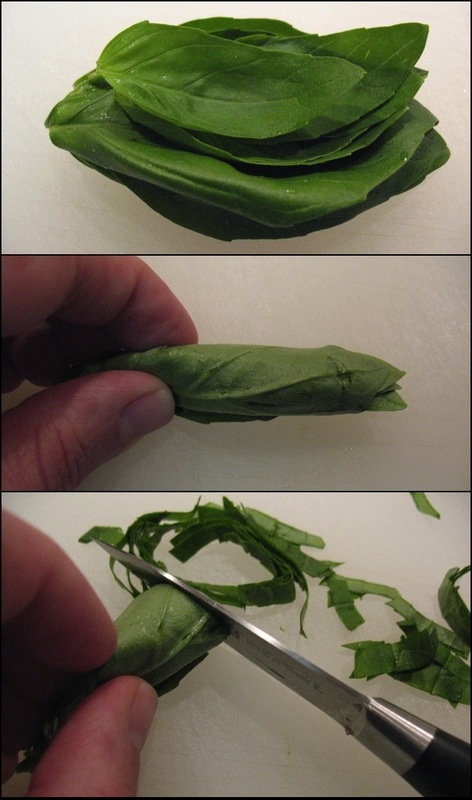 Cover with plastic wrap and let rest for about 30 minutes. 3. After resting, place dough on well-floured surface and roll out until quite thin, no thicker than 1/8-inch. Using a pizza cutter or knife, cut dough into strips about 1/2- to 3/4-inch wide. 4. 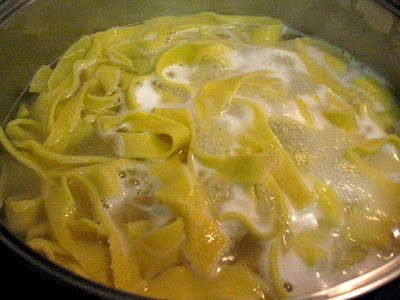 To cook pasta, bring a large pot of salted water to boil and cook noodles until al dente, about 3 minutes. Drain and set aside. 1. Heat a large saute pan over medium heat. Remove sausage from casings and add to pan. Cook until browned, breaking up with a wooden spoon as it cooks. 2. Add onion and seasoned salt and saute until softened and lightly browned. 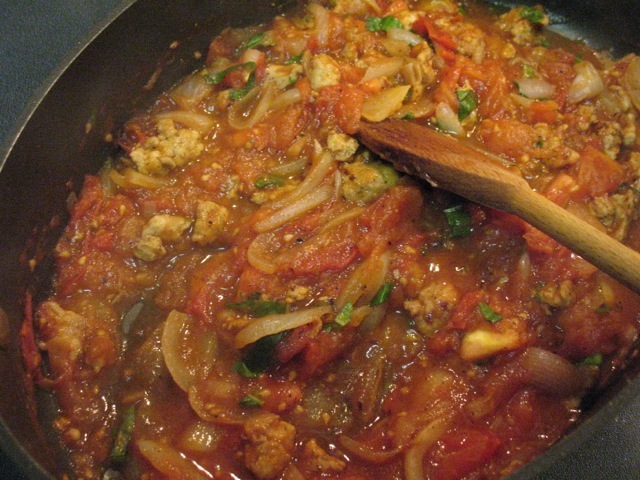 Add oregano and tomatoes and continue to cook until tomatoes have softened and given up their liquid, making a chunky sauce, about 8-10 minutes. Add basil, nutmeg and pepper. Serve over pasta topped with cheese. For this salad, I wanted a slaw with a distinctive southwestern flavor and something easy I could make mostly using the food processor. I was pretty happy with the results, which have a clean, fresh taste. I learned something making this: bell peppers don't do well in the food processor. If I were to make this again, I would just dice them. They end up expelling a lot of water, which I mopped up. 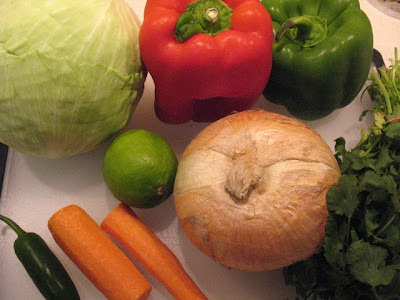 Drop the chicken and this is a great side dish to have with tacos or black bean soup. Certainly, you could tweak the vegetable combination. I think some cold cooked corn would be good in this, for example. Vegetarian might enjoy it with a can of black beans instead of chicken. 2. Combine slaw ingredients and toss with dressing. Allow to sit for about 30 minutes. 3. Heat olive oil over medium heat in a medium frying pan. When hot, pat chicken dry and add to pan. Season with oregano, seasoned salt and pepper. Cook chicken about 10 minutes, turning halfway through. About a minute before taking out of the pan, squeeze the lime over the chicken and turn the chicken to coat both sides with lime juice. Remove chicken from heat, allow to cool, and chop. 4. 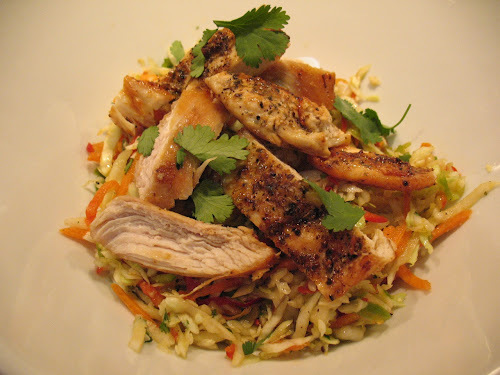 Serve slaw in a bowl topped with chicken and extra cilantro for garnish. Just like many restaurants, we have a house wine, or rather a house brand of wine, which is Columbia Crest, the Paterson, Washington winery that makes great wines at exceptional value. I can't remember when we became fans of Columbia Crest, but we've been devoted to the brand for many years. 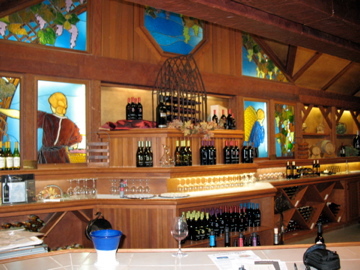 Chris and I had the chance to visit the winery in 2009, which was real treat. 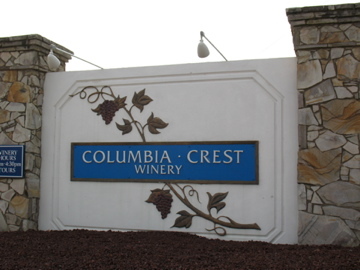 Columbia Crest divides its wines into four tiers. At the high end is the Reserve label, which the winery considers its top 1% of wines. Its selection is the most limited and varies, dominated by reds. They occasionally make a Reserve dessert wine. They retail for $30-$75. There are two mid-tier labels: Horse Heaven Hells or H3, which retails for $15, and the more common Grand Estates line, which retails for $12, but can frequently be found at much lower price. Calvert-Woodley, for example, routinely prices Grand Estates at $8 and sometimes marks it down even lower (I've seen it as low at $6.88). Grand Estates is a real bargain. Even at $12, it tastes more like a wine priced in the $20s, with reds that exhibit rich, bold flavors. 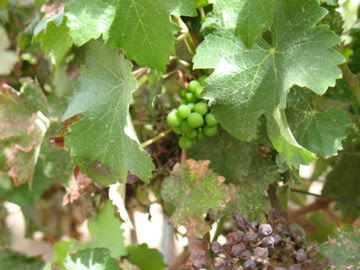 There are six varieties of H3 and eight of Grand Estates, including cabernet sauvignon, merlot, chardonnay and pinot gris in both. One of the more unusual Grand Estates offering is the Amitage, a red blend of mostly merlot with syrah, cabernet france, cabernet sauvignon and malbec, which sounds like an attempt to make a distinctive meritage (rhymes with "heritage"), an American version of Bordeaux. On the bottom is the Two Vines brand, of which there are nine types that retail for $8, but like Grand Estates, can routinely be found for less. They aren't bad, but represent a significant drop in complexity from Grand Estates, which is usually only a little higher in price. From a cost/benefit standpoint, I usually find the best value in the Grand Estates line, which rarely disappoints. We almost always have the Grand Estates merlot and cabernet sauvignon on hand, making them our "house" wines. We've noticed differences from year-to-year: sometimes we like the cab better; sometimes the merlot is king. I generally prefer the years when they do more blending, particularly if there's a higher percent of cabernet franc to add depth. 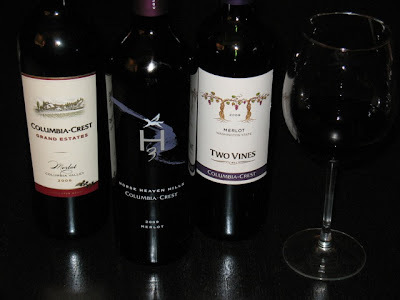 I decided it would be fun to do a taste test, comparing the merlot and cabernet sauvignon offerings in the three more common tiers: H3, Grand Estates and Two Vines. Two Vines, 2009. 80% Cabernet Sauvignon, 18% Syrah, 2% Merlot, 13.5% alcohol. Grand Estates, 2009. 87% cabernet sauvignon, 7% merlot, 6% syrah, 13.5% alcohol. H3, 2009. 88% cabernet sauvignon, 7% cabernet franc, 3% syrah, 2% malbec, 14.5% alcohol. The Grand Estates was the standout of the cabs, showing a richer, deeper flavor and more distinctive scent than the Two Vines. The higher alcohol content of the H3 was noticeable and, although we liked it better than the Two Vines, it wasn't as good as the Grand Estates. Both were pretty smooth, with the H3 being a bit spicier. Two Vines, 2009. 13.5% alcohol. Grand Estates, 2008. 90% merlot, 5% cabernet sauvignon, 5% cabernet franc, 13.5% alcohol. H3, 2009. 96% merlot, 3% cabernet sauvignon, 1% malbec, 14.5% alcohol. For the last 3 years or so, we've been particularly fond of the Grand Estates merlot, while the cab had been our favorite prior to that. 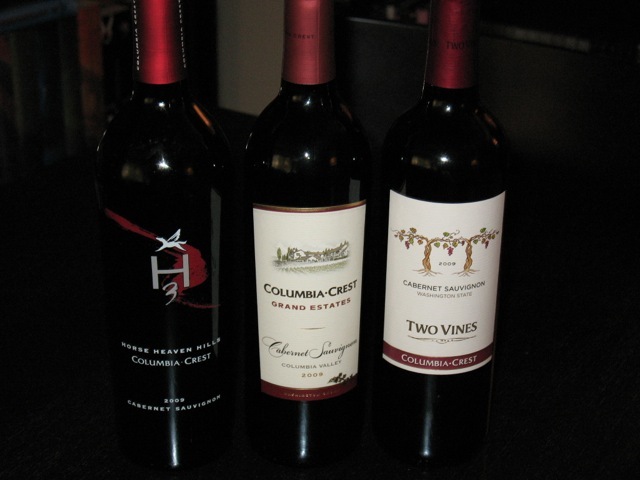 So we were surprised to discover that the H3 was our favorite among the merlots. It had a richer aroma and a more refined taste than the other two. The Two Vines was good, but not very distinctive. The Grand Estates was noticeably more assertive than the Two Vines, with a better finish, but fell short of the H3. Isn't the Columbia River valley beautiful? I drove past this all the time 15 years ago. It's the battle of the front-page condiments this week as both papers featured stories about DIY barbecue sauce (Post) and Mayonnaise (NYT). The barbecue sauce contest is now an annual tradition for the Food section, one I follow closely as a keen lover of barbecue sauce. Sadly, lacking a grill of my own, I only get to barbecue when I'm at my family's beach house (even sadder, it's 3,000 miles away), but there are other ways to use barbecue sauce, including oven and slow-cooked recipes. This year the Post divided entries into three divisions: tomato-based, mustard-based and "alternative." Jim Shahin's story remarked that many of the submissions seem to fall in the last category, as contestants further blur the lines as to what constitutes barbecue sauce vs. other types of sauce. While Betty's Best BBQ Sauce (tomato-based) and the Oriental Express Sauce (alternative) both sound good, my favorite is the mustard-based Jannelle's Delectable Sauce. 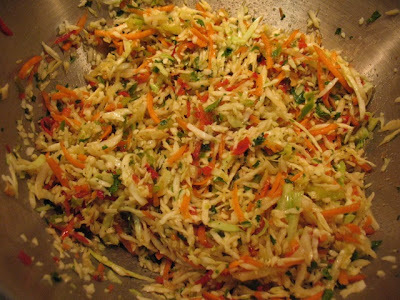 Other interesting recipes this week included Joe Yonan's Smoky Cabbage and Udon Slaw, which calls for Grilled Cabbage, and accompanies his article on how to efficiently Grill for One. I've had a hankering for tuna lately, so I may try Stephanie Witt Sedgwick's Nourish recipe, Roasted Red Pepper, Tuna and Bean Salad. For Dinner in Minutes, Bonnie Benwick offers a Kale and Cucumber Salad with Avocado-Tahini Dressing, which may just help use up that jar of tahini sitting in the back of my fridge. Jane Touzalin reviewed two cookbooks of recipes for pressure cookers, which both sound interesting, although I would have preferred more of a feature story on pressure cookers, including some tips on which ones are the best. Lastly, Tom Sietsema did his first bite on Sixth Engine, a new restaurant in downtown D.C. near Chinatown and Mount Vernon Square that resides in a converted historic firehouse and serves upscale pub fare (it's working its way into my regular lunch rotation). Melissa Clark penned Dining's centerpiece story today on homemade mayonnaise. It's something I've never tried myself but would like to if I can get ahold of some pasteurized eggs. She has some good tips for how to make the emulsion work, such as adding a little bit of water to the egg yolk. Pete Wells reviewed one of New York's four-star restaurants, Le Bernardin, the seafood restaurant that is the jewel in Chef Eric Ripert's restaurant empire. Wells upheld the restaurant's four-star rating, which it has always enjoyed since its first review in the mid-'80s. 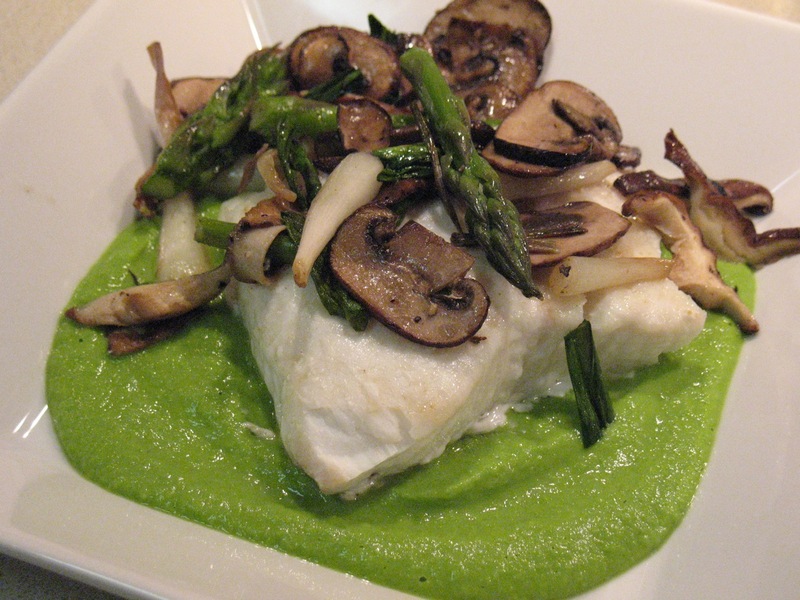 David Tanis writes about his retro recipe for Egg Batter Pan-Fried Flounder with Green Garlic, which he describes as hearkening back to the era when many fine dining restaurants described their cuisine as "continental." The Washington Post. With the delicious annual barbecue sauce and a lot of great grilling-related content, the Food section has outdoor cooks primed and ready for summer. This might turn into a barbecue week, basically by accident, if you can believe it. Thanks to a tip from Jessica Sidman, Washington City Paper's newly installed Young and Hungry food writer, I got lunch today from the Pork Barrel BBQ pop-up at the downtown D.C. Living Social location (918 F Street NW). 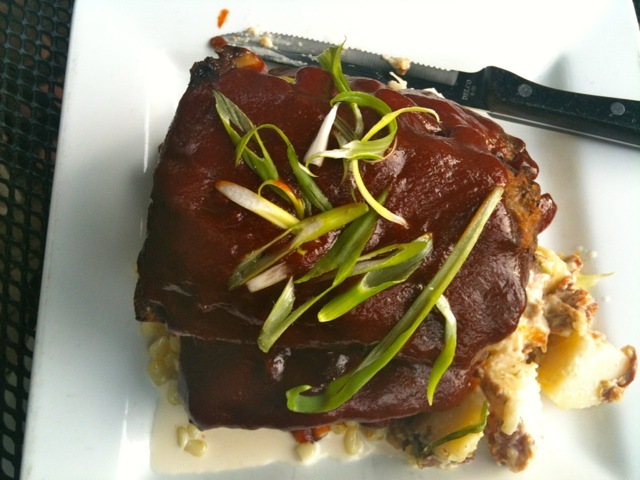 Pork Barrel BBQ is a barbecue restaurant in Alexandria, Va. The pop-up runs just this week everyday through Friday at 11 a.m. to 2:30 p.m. And they're only serving one thing but it's really good: a barbecue pulled pork sandwich with your choice of sides. The sandwich is really good, the tender pork has a wonderfully smoky flavor and just a little spice. I like that they put the sauce on the side; it's good, but the meat isn't drenched in it, which is nice. 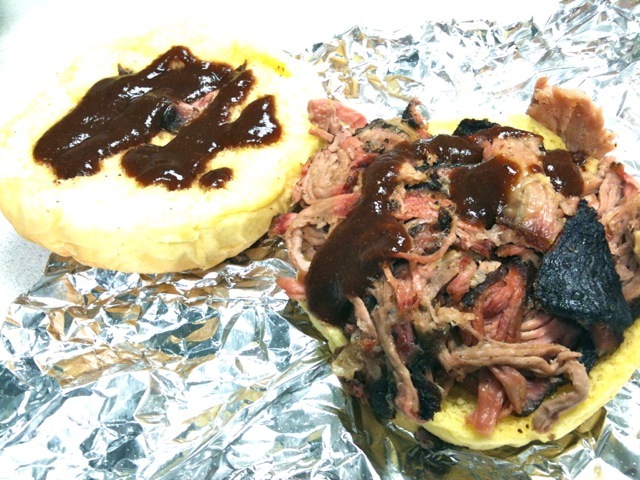 The chewy potato bun provides a nice cushion to the meat. This is probably the best barbecued pork sandwich I've eaten lately. The setup is a little odd, but it works fine. You order your food from the Living Social lobby area. The people working there were certainly friendly. 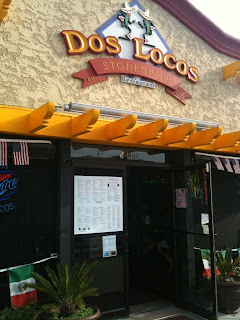 They run upstairs where your food is prepared and bring it down when it's ready. 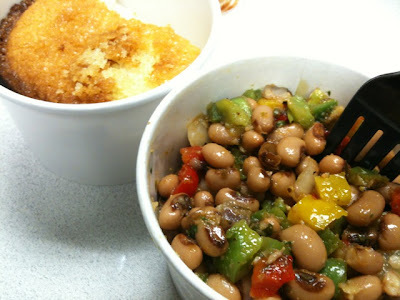 For my side, I considered coleslaw or potato salad but opted instead for the more mysterious "Texas Caviar," a black eyed pea salad with red, yellow and green bell pepper, onion and a touch of spice. 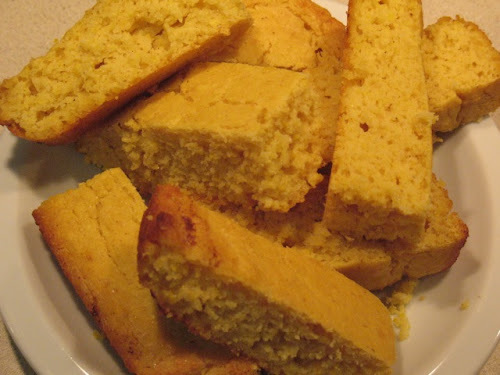 You also get corn bread, which is so fluffy and sweet it's rather more like corn cake. For anyone who works downtown and loves barbecue, I definitely recommend a stop this week. The corn cookies I made recently were so good, in part from the amazing corn flavor from the freeze-dried corn. If that worked so well in the cookies, I thought why not try it in corn bread? 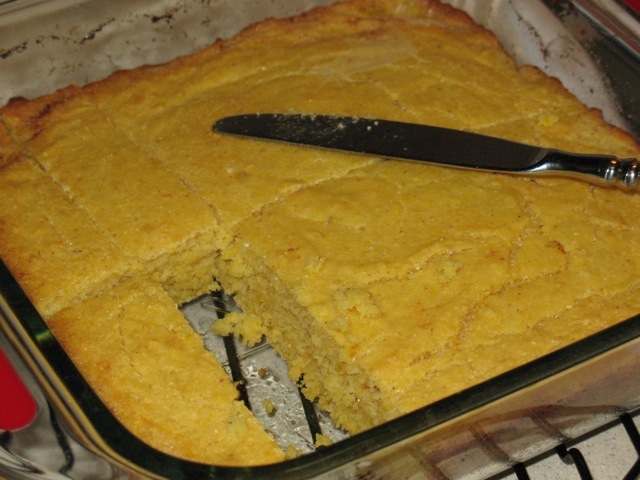 Turns out, it was good impulse as this corn bread was awesome. Quite corny, so to speak. I worked off of Mark Bittman's corn bread recipe, which is a pretty basic recipe, substituting 1/2 a cup of ground freeze-dried corn for 1/2 cup of the corn meal. Like I did for the cookies, I just ground it in a food processor until it was really fine. I went with a little more sugar too. 2. Combine dry ingredients in a large bowl. Separately, combine egg and buttermilk, add to dry ingredients and stir until just combined. 3. When oven is hot, put an 8 x 8 inch baking dish in the oven. Remove after a couple minutes when it's hot and add the butter, put back in the oven and let it melt (be careful not to let it burn, as butter will scorch at this temperature). 4. Remove hot pan with melted butter from oven and pour batter into pan. Bake for about 30 minutes until top is lightly browned and a toothpick inserted in the center comes out clean. Let cool, but serve warm. This year's unseasonably warm east coast winter means strawberries are ready earlier than usual. The ones I picked up recently were plump and sweet, a perfect counter to the peppery, bitter arugula from the same stall. I rounded out the flavors by toasting some walnuts and shaving a block of Parmigiano-Reggiano. 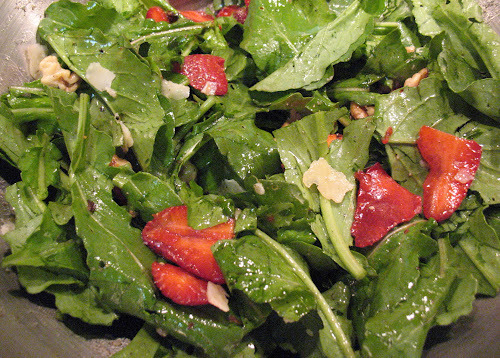 And I think a good quality balsamic vinegar complements strawberry perfectly. This makes a nice lunch salad to accompany a sandwich or bowl of soup. 1. Slice the strawberries. Combine in a large bowl with arugula. Toast walnuts in a small frying pan over medium-low heat until fragrant. Set aside to cool before adding to salad. Using a vegetable peeler, shave thin pieces of Parmesan into bowl. 2. Whisk together olive oil, vinegar, salt and pepper. 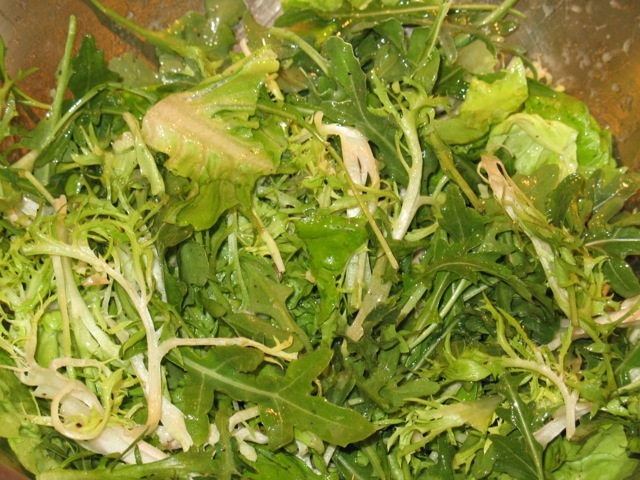 Toss vinaigrette with salad. There are weeks when reading the Washington Post Food section and the New York Times Dining section is a true pleasure and source of inspiration. This isn't one of those weeks. The cover of today's Food section featured a big picture of different types of ice creams, which got me excited off the bat. Unfortunately, Tim Carman's story about Jamaican ice cream left me feeling like a soggy cone. While I thought his description of the ice cream was well written, I felt like he didn't adequately explain what Jamaican ice cream is or why it's a "thing" (why Jamaican? Is Puero Rican ice cream also a thing? Cuban? And why is a Caribbean island known for ice cream anyway, since, as far as I know, the only other region I've heard of that produces a well-known distinctive ice cream is Italy and its gelato). Jane Black contributed an informative piece about FreshPaper, a new food invention that helps prolong the life of refrigerated produce by further inhibiting the growth of bacteria and fungus that makes food go bad. Sounds great. My only gripe is that although she told us we could get the product at a couple of area farmers markets, she didn't say that you can also get it here. On the plus side, Bonnie Benwick delivered on her usually good Dinner in Minutes column with a recipe for Pan-Fried Veal Chops with Rosemary-Almond Aioli that sounds quite delicious. I also liked the short Good to Go feature on Sugar Magnolia, the new bakery storefront at Cleveland Park's Ripple. The Dining cover story is Jeff Gordinier's feature about the rising quality of food at music festivals, which is clever, but doesn't really interest me. Neither does Cathy Barrow's story about canning vegetables. I'm really not into canning. Julia Moskin's story about chefs Thomas Keller and Andoni Luis Aduriz was interesting, in which the famous chefs discuss inflated views about chefs' roles in saving the planet (they think it's unrealistic) and the drive to source ingredients locally (they buy locally, but they're really more interested in quality than local for the sake of it). The interview was conducted a Per Se, a restaurant I would love to visit someday (well actually, I have visited it, sort of, having gazed longingly at its interior from the doors, which then opened automatically when I got too close, drawing the hostess. Oops... embarrassing). As usual, the page 2 recipes both sound really good, particularly Melissa Clark's Asparagus with Walnuts, Parmesan and Brown Butter. The other recipe, an Asian stir-fry of Twice-Cooked Duck with Pea Shoots from David Tanis sounds like another good answer to my question about what to do with pea shoots. The best recipe, though, is Mark Bittman's Frank de Carlo's Black Chickpea Soup, the latest entry from his new How to Cook Everything column. I've opined at length about my Mark Bittman fandom, which has driven me to buy the iPad app version, even though I already had the iPhone version (the iPad version is a much richer experience and his recipes are so good, it's worth it). Pete Wells reviews Perla, a new Greenwich Village Italian restaurant that sounds decent but not noteworthy. The New York Times. 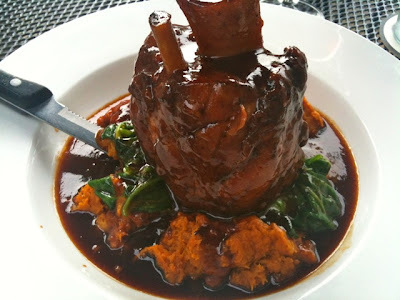 It's a tough call this week, but I think Mark Bittman and Thomas Keller beat veal chops and FreshPaper. 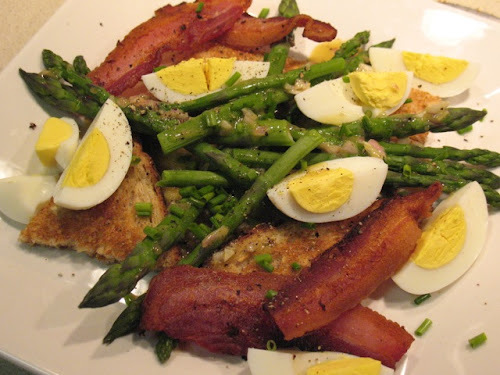 Breakfast on the farm means eggs, although the ingredient in this dish from the farmers market is the asparagus, which is drizzled with a shallot-mustard vinaigrette and paired with bacon, hard-cooked eggs and toast. I was inspired by the recent New York Times' recipe for Asparagus with Mustard Vinaigrette, to which I made a few tweaks. For the hard-cooked eggs, I tried the America's Test Kitchen technique. They claimed their method prevented that unappetizing gray-green layer from forming between the cooked yolk and white. Turns out, they were right. No green in sight and the eggs were perfectly cooked. I'll have to remember this when I decide to try my hand at deviled eggs. For the dressing, I pretty much followed the recipe but added some honey for a little sweetness. The resulting dish was a satisfying savory meal to begin the day. 1. 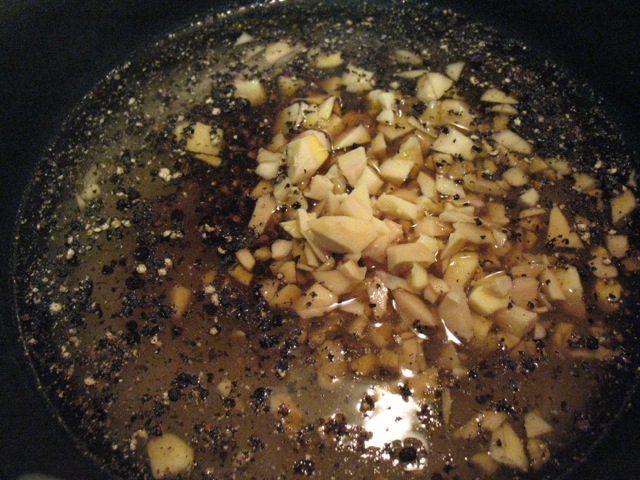 To make vinaigrette, whisk together shallots, vinegar, mustard, honey, olive oil, salt and pepper. Set aside while cooking the rest, which will soften the shallots a bit. 2. To hard-cook the eggs, place the eggs in a medium sauce pan and cover with cold water until there is an inch of water above the eggs. 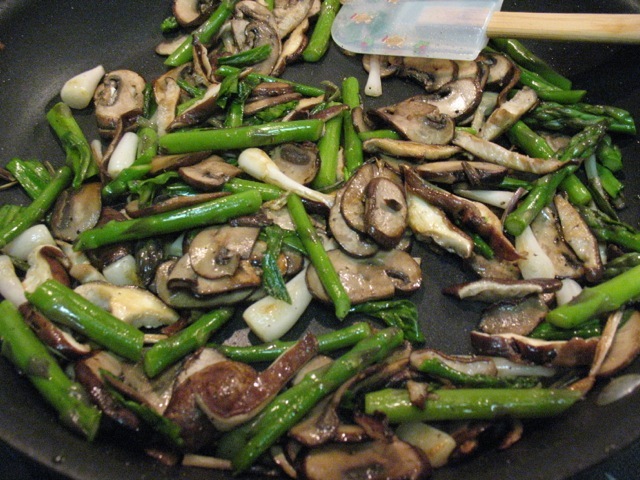 Place pan on stove and heat over medium-high heat until the water boils. Immediately remove pan from heat, cover and let sit for 10 minutes. 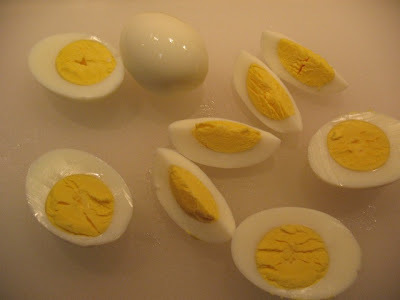 Then place eggs in ice water for 5 minutes (this makes them easier to peel). Carefully crack eggs all over, roll gently on a hard surface, and then use your hands to remove the shell, starting at the less-pointy end. Rinse the peeled eggs by dipping them in the bowl with the ice water. Slice into fourths. 3. Cook the bacon over medium heat until crisp. Drain and set aside. 4. 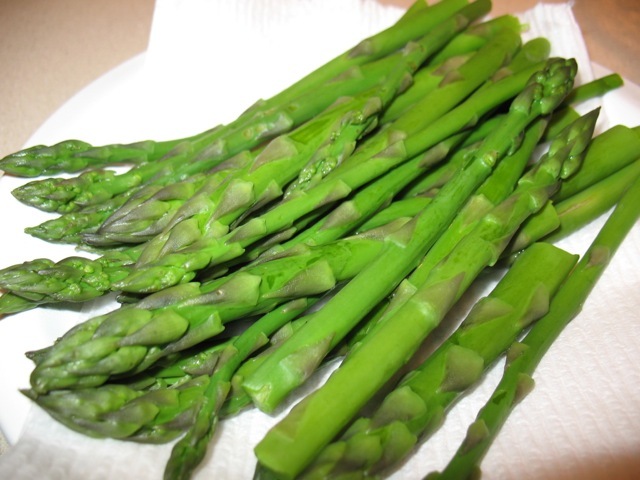 To cook the asparagus, fill a large saucepan about halfway, salt the water and bring to a boil. Cook asparagus for about 3-4 minutes. Remove asparagus from water once cooked. 5. Serve eggs, bacon and asparagus over toast topped with a few spoonfuls of vinaigrette. With the weather getting warmer, I'm feeling the pull to visit farmers markets. 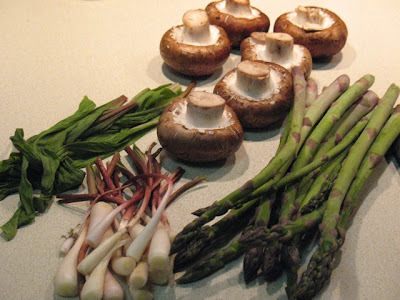 This week's recipes will feature ingredients available now at markets local to D.C., specifically asparagus, mushrooms, ramps, greens and strawberries, used in dishes for breakfast, lunch and dinner. Although many farmers markets operate year-round, their winter selection often pales to the greater abundance of foods available in the spring and summer, a cycle that peaks in late summer, by which times markets will be brimming with tomatoes, corn, fresh herbs, greens, and...I could go on a long time. Why buy at farmers markets? The big difference in buying ingredients from a farmers market vs. a conventional supermarket is that the food at the farmers market is grown locally, which yields a number of benefits. 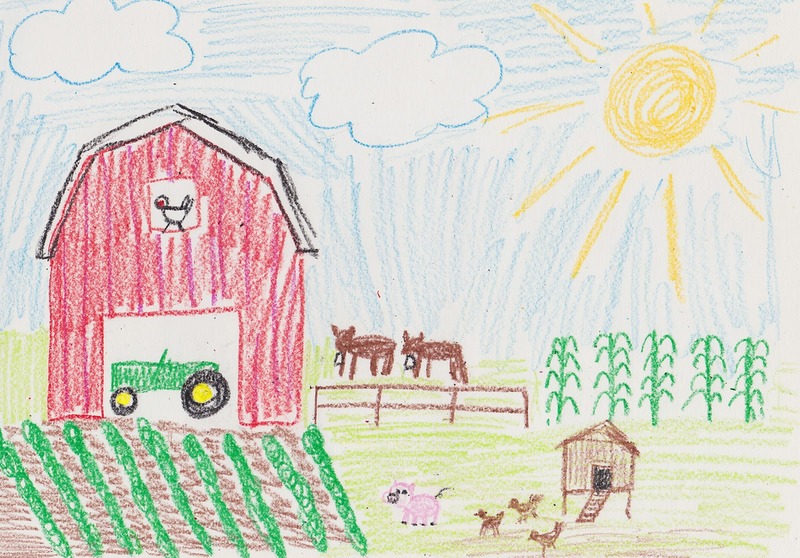 With all the buzz about buying organic food, a second perhaps more important drive to buy locally hasn't gotten as much attention. Often, you kill two birds with one stone, as farmers market food often is organic. The benefits of buying food produced locally are numerous. Since it hasn't been shipped long distances, it's fresher, which means it tastes better and has more nutrients. It's thus also better for the environment, having avoided the energy requirements of international shipping. By eliminating the grocery store as distributor, you get to buy the food directly from the supplier, allowing you to form a closer relationship to the source of your food. 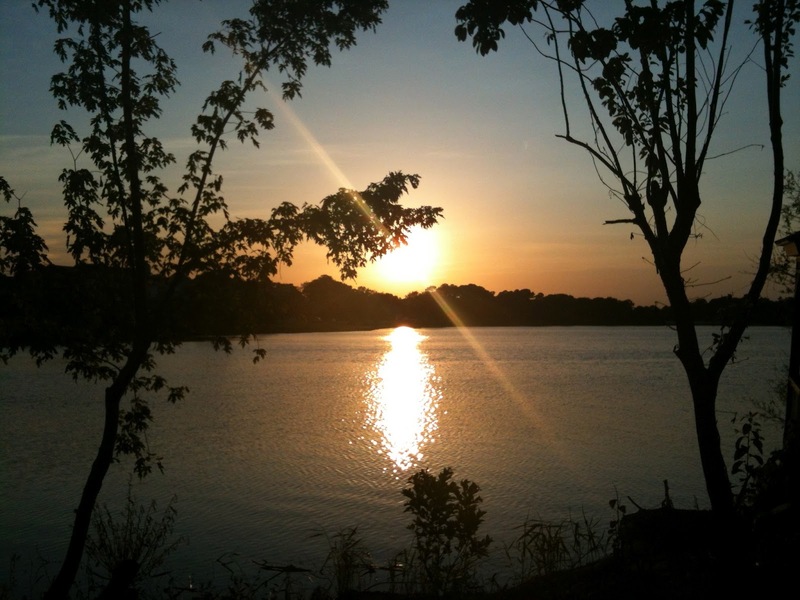 You also get to experience food in a more natural manner that reflects the seasons. The variety available at the farmers market constantly changes as foods come in to season. Shopping at a grocery store, you may not even be aware of what's in season, since apart from a few ingredients like corn, grocery stores tend to stock the same things year-round, whereas farmers markets offer only what's available seasonally. If you like buying tomatoes in January, that may be a downside; however, let's be frank: tomatoes in January are nasty ghost-like things that bear little resemblance to a juicy, ripe, red-fleshed tomato. Buying food seasonally means you're getting ingredients at their peak, which means your dishes will taste better. 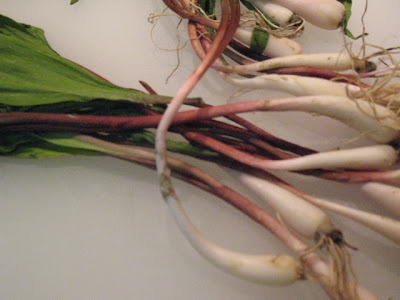 Farmers markets also often have items that you'll never find at a grocery store: garlic scapes, heirloom tomatoes, specialty herbs, beets in colors other than purple and carrots in colors other than orange. They also have foraged foods like ramps, unusual types of mushrooms and stinging nettles. Often you have to really hunt for those things (since, after all, the farmer had to as well). The downside of the farmers market is that it is often more expensive than buying at the grocery store, since they aren't able to take advantage of economies of scale to drive down prices. However, you can get good deals, particularly at peak harvest time. And I find that the old adage "you get what you pay for" is true. A panzanella salad made with tomatoes, basil and cucumbers harvested just days ago locally will taste markedly better than making the same salad with ingredients trucked from California or flown in from South America. Since I'm an Oregon boy, I couldn't help but feel a connection with The New York Times' recent article about Oregon chardonnays. In fact, for awhile, my father co-owned a winery with some of his friends, although I don't think they made much, if any, chardonnay (it was mostly pinot noir and riesling and, since I was about 8 at the time, I wasn't into it). To pair with the wine, the Times also ran a recipe for Coq au Vin Blanc, a variation on the classic French dish made with white wine instead of red. It's a lighter version of the dish, perfect for spring, as it also ditches the cream and bacon that typify the dish. I lightened it up even further by substituting boneless/skinless chicken pieces. Don't worry, there's still a nice dash of truffle butter added at the end for richness. Perhaps the biggest challenge with this dish was procuring the oyster mushrooms. What exactly are they? I had no idea. 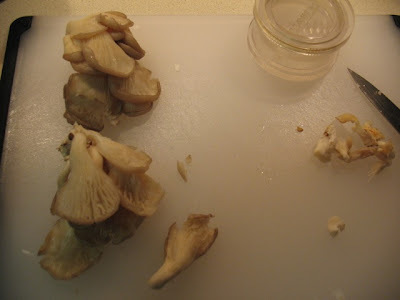 At Whole Foods, the bin marked "oyster mushrooms" was filled with creminis. Even the nearby employee mixing up guacamole samples had no idea what they looked like (thankfully another shopper found them for me in an unmarked bin). I also wasn't quite sure how to prep them, but I read that their stems are really tough, so I cut off all the flat pieces and trimmed off and discarded any remaining connecting stems. One thing I did differently was to dredge the chicken in flour, this also helped to thicken the resulting sauce when the wine is added, so no additional flour or cream was needed as a thickener. I also added some thyme, in addition to the tarragon the recipe called for. I served this with a crusty baguette for soaking up the sauce and a simple salad of arugula and frisée with a lemon-white wine vinaigrette. 1. Heat olive oil in a 4-quart dutch oven over medium heat. Pat chicken pieces dry and dredge in flour. Add half the chicken to the pot and season with seasoned salt and fresh-ground pepper. After a couple minutes, turn over to brown other side. Remove to a plate when done and brown the remaining chicken pieces (chicken will cook fully later). 2. 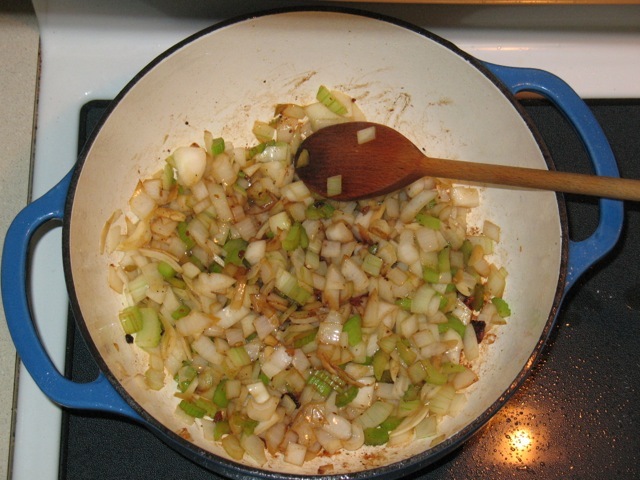 Add the pearl onions and saute until lightly browned. Remove. 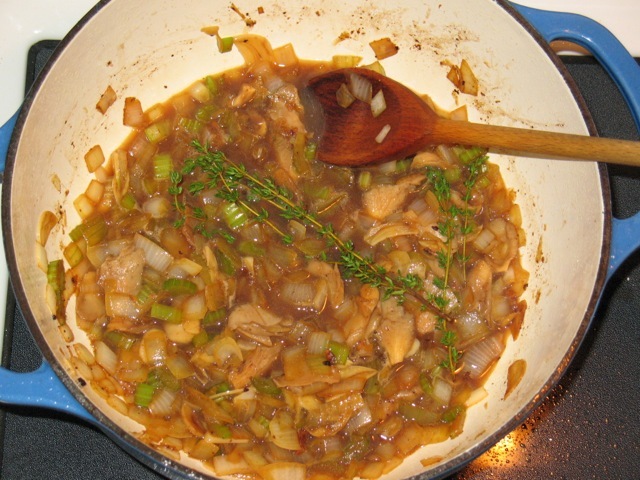 Add the chopped onion, celery and garlic, and cook until softened. Stir in the mushrooms. When they wilt, add the wine and thyme, bring to a simmer and season with salt, pepper and lemon juice. Return chicken to pot, cover and cook 25-30 minutes. Check the temperature of the chicken with an instead-read thermometer and remove the chicken when it has cooked (165-170 F). 3. 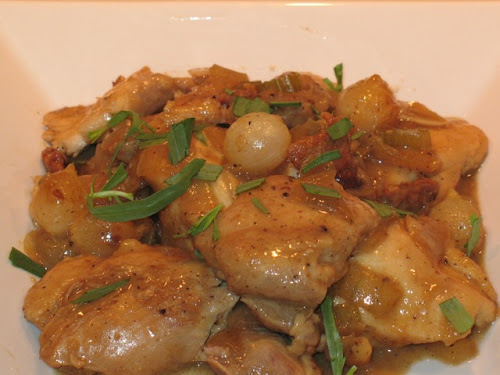 Return the pearl onions and chicken to the pot, add truffle butter and simmer a few minutes to reheat ingredients. Serve chicken pieces with a generous portion of sauce and vegetables topped with chopped tarragon.